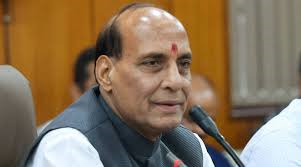 New Delhi : Home Minister Rajnath Singh on Saturday asserted that ISIS has been unable to establish a hold in India, adding that there is an improvement in the security situation across the country. "We have been successful in countering the challenges posed by the ISIS," Rajnath said in a press conference on the completion of three years of the Narendra Modi-led government. "After the surgical strikes by the Indian Army in September last year infiltration in Jammu and Kashmir has come down 45 percent.